The trick was to export only the lines of my logo with a transparent background as .png file out of photoshop, so that way only the lines are imprinted on the Shirt and not a whole square area that would make it kind of stiff. 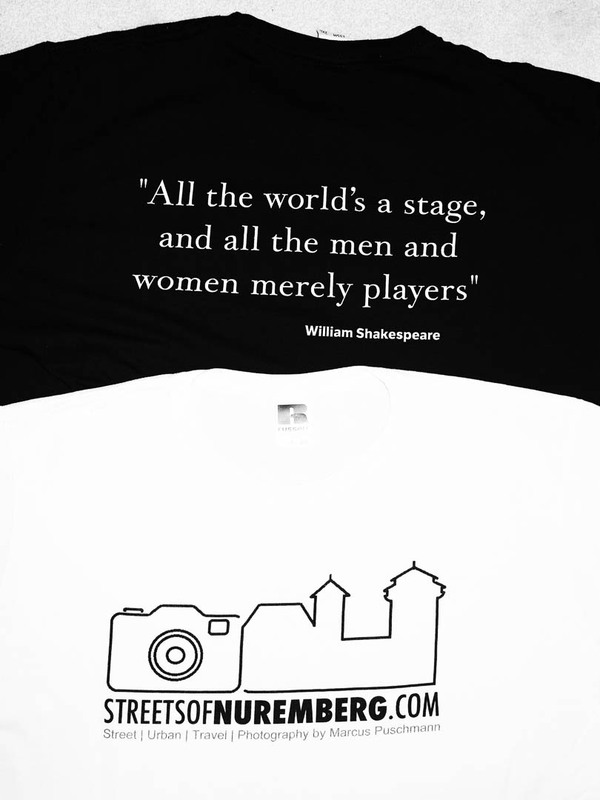 The text underneath the logo and the Shakespeare Quote on the back (from my “about this blog” page) I made with the text feature of the design software on the vistaprint website. All in all it took me no more than 30 mins to finish the shirt. I created two basic versions with a white logo and text on a black shirt and then the reverse. The designs are saved under my user account, so I can always replicate and create derivates, e.g. a long sleeve shirt or using different quotes on the back. Cost and quality of the T-Shirts were surprisingly ok. They came out great, as you can see from the photos. 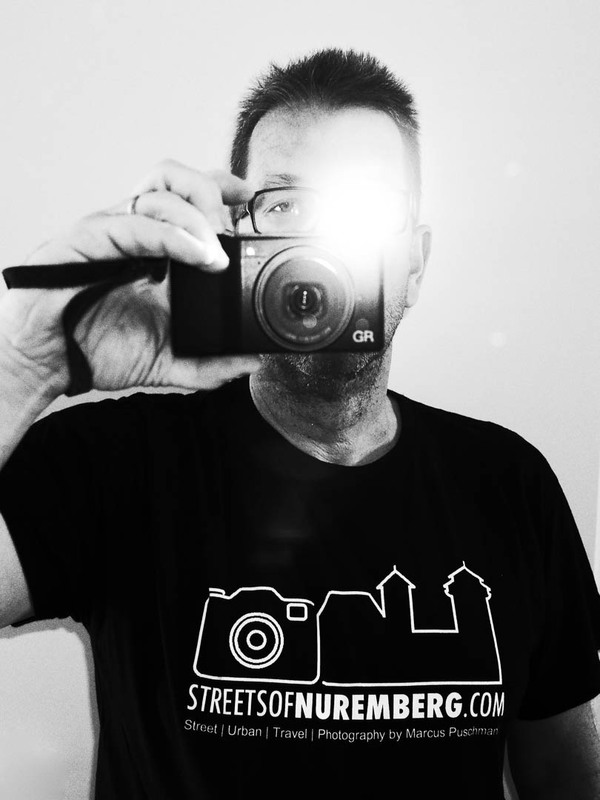 So I’ll be my own billboard when roaming the Streets of Nuremberg with my camera. Or those of other cities…. (hear me, my Portland readers 😉 )? It turned out really well. Will you wear it when you go out shooting? I hope it generates a lot of interest. I love this soooo much and it turned out awesome. When I come home I need to buy one of those in addition to the mug I already committed to. Congratulations, you rock my friend. Thank you my friend, it means soooo much! These items are great gifts to people who are special. Should I design a lady’s version as well 😉 ? Hope your Mama is ok!! Fingers are crossed!! You are very welcome and of course we need a ladies version as well. No question about it. I am so proud of you and the process of building your brand. Thank you so much, Marion, really love your beautiful words! It is meeting great people like you that make it so much fun! Happy blogging and exploring to you too 🙂 !! Now I’ll recognize you in my fair city! Thank you Nia, love your comment 🙂 ! !